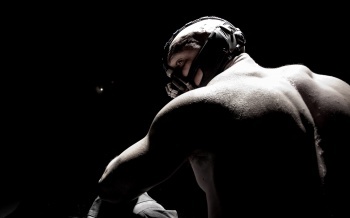 The beginning of Dark Knight Rises' viral marketing campaign has uncovered the first photo of Tom Hardy as Bane. Christopher Nolan's third Batman film, Dark Knight Rises, recently began shooting in India, and so has begun its official marketing campaign. The newly launched Dark Knight Rises website currently features an auditory secret that has led to the first reveal of Tom Hardy in his Bane suit. Except it really isn't as much a suit as a creepy mask and some cargo pants. Still, that mask is suitably creepy. Visiting the website (as of this writing) plays an audio file of a group of people chanting that definitely sounds like it needs to be recorded and put through some remixing magic. Thankfully, someone already did that, discovering that the chanting says "the fire rises." Totally not coincidentally at all, a twitter account called "the fire rises" was recently set up. Whenever someone tweets the hashtag "#thefirerises," their Twitter image appears here in a collage building a greater image. Internet sleuths have already siphoned the final image of Tom Hardy as Bane out of the ether, but it's still a neat viral marketing scheme. Dark Knight Rises isn't scheduled to launch until July 20, 2012, so we have a long road of decoding secret Batman-related messages ahead of us if this is how it starts. The term "the fire rises" is curious in comparison to "dark knight rises" as it seems to point at some kind of "fiery" antagonist rising up to face Batman. Already revealed for Dark Knight Rises is a young Ra's al Ghul, who could be revived in the probably fiery Lazarus Pit rumored to be in the film. That's my guess. As for how Bane fits in, I'm not sure, but judging by Hardy in this photo he's probably going to be punching the hell out of something.